TwoBulls Pro Sports Rub is a highly effective Pain Relieving, Anti-inflammatory Cream that was developed specifically for Bull Riders and Bullfighters. Based on the knowledge of the pain these Athletes suffer, TwoBulls developed an all natural product that could effectively relieve chronic pain and inflammation without the negative side effects of drugs. Utilizing the Bull Riding/Bullfighting Athlete as our model of Chronic Pain sufferer, we were able to develop a product that would be effective for just about any consumer that suffers from chronic pain from Arthritis, Injury, and Surgery etc. 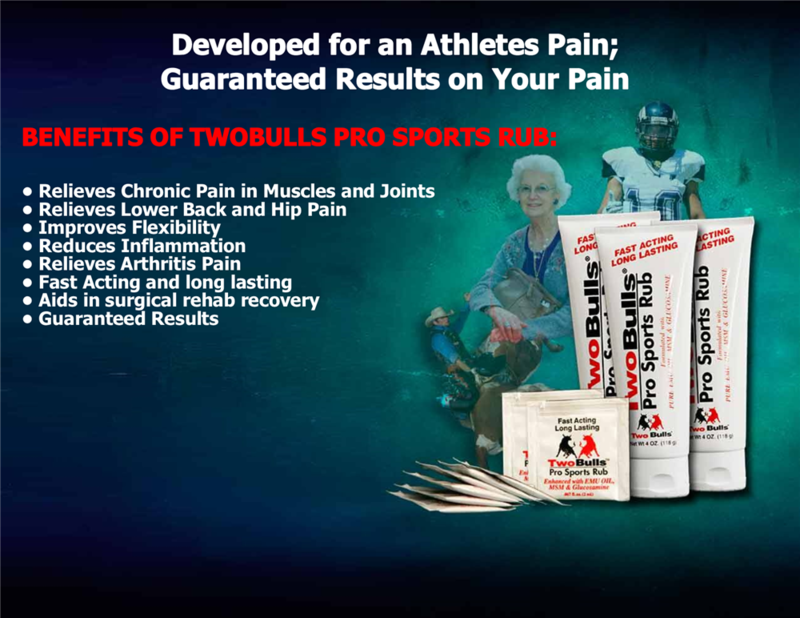 With the knowledge that not everyone suffers the abuse these athletes do on a daily basis, but have a need for a pain reliever of this quality, we formulated the TwoBulls Pro Sports Rub to work effectively for Athletes and fans alike. Preventative maintenance is important to all Athletes' regardless of sport. By utilizing TwoBulls Pro Sports Rub before you work out, train, or compete, an Athlete can reduce injuries from over exerted, strained and fatigued muscles, which lead to more serious problems.